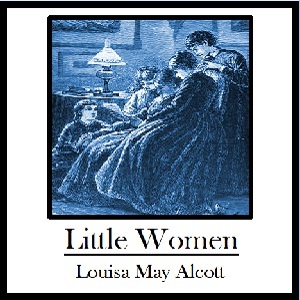 Little Women is the classic story of The March family, which consists of Mr. and Mrs. March and their four girls--Practical, yet fashion conscious Meg, who longs for the nice things they used to have. Rambunctious, book worm, Jo, who wants to become a writer and wishes she were born a boy. Shy and quiet, home-loving Beth, who loves to play the piano and play with her kitties. Finally, the youngest, artistic Amy, who longs for an aristocratic nose! The story takes place during the American Civil War, and begins with Mr. March away from home as a chaplain to the Union army, while his wife and daughters remain at home to work and wait for his safe return. This book follows their joys and sorrows and scrapes along the path to the girl's becoming grown up "little women".